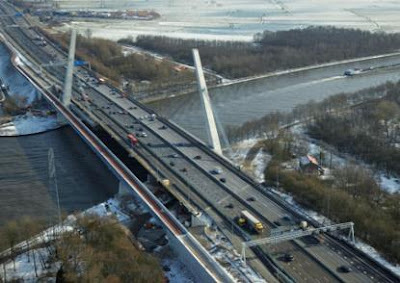 The Fietsberaad reports that a new large cycle bridge has been opened in parallel with the existing Muiderbrug which crosses the Amsterdam-Rijnkanaal and carries the A1 motorway. "The cycle path between Muiden and Diemen is an important route for commuters, school-children and recreational use. This new bridge is a crucual link in regional and national cycle route networks, as it is one of the few places to cross the Amsterdam-Rijnkanaal by bike." I have cycled over the existing bridge. You didn't have to cycle on the motorway, there was already a parallel road for local slower traffic on the bridge. However, this wasn't for bicycles only and it will be a big improvement to have a separate path. A big boost to subjective and actual safety. The new bridge is 318 metres long and 4.6 metres wide. It is 9 metres above the water, enough that container ships can pass beneath the bridge. Built of steel and to match the existing bridge, the new bridge cost 21 million euros. There are several other stories about bridges, including one about another big bridge in Nijmegen and a somewhat shorter bridge in New Zealand that cyclists are banned from. "This new bridge is a crucual link in regional and national cycle route networks, as it is one of the few places to cross the Amsterdam-Rijnkanaal by bike." Most but not all bridges across the Amsterdam-Rijn Canal are accessible to bikes. The A27 near Houten (and the A27 across the Lek river) are car only. There are a few railroad only bridges. Of course, near Amsterdam all bridges are accessible to bikes. That doesn't mean that the canal isn't a major pain in the you-know-where when you need to get across. For Amsterdam-Almere this particular link is a pretty large improvement. Also - any solid barrier like canal or river is more of an obstruction to a bike than a car because an extra, say, 5 miles is much more significant to a bike (or even more so to pedestrians) than cars. So the more crossings the better. I remember riding under that last September while the bridge was being built. Well, I just hope this bridge was worth it, because it sounds like a lot of money was spent on a route that wasn't that bad to begin with. (I'm not familiar with either the old or the new situation.) But I do know that cycling advocates don't always have their priorities straight. Cycling is "booming" in the UK ?